My email and phone has been really quiet the last two days. My messages to people have been going unreturned. The only topic people want to talk about at work and around town is the craziness of Wall Street. In the last few days, job seekers with felony convictions have been changing their tune from how difficult their search has been to how the economy is making it impossible. The reality is that it’s always been almost impossible for felons to find jobs. These recent days are reminding me of the time shortly after 9/11. We all seem rattled by current events. But we need to take a step back from the cliff and regain our perspective. Fear seems to be gaining an unhealthy place in our lives. And like a tennis player ready to make that game winning shot, we are in danger of letting fear and stress tighten our muscles causing us to hit the ball into the net. At this moment, we must not underestimate the role unnecessary fear has in hurting our economy further. One of my regrets from my undergraduate studies in Economics 20 years ago at the University of California at San Diego was not doing an independent study on the impact of psychological assumptions of economic models. At the time, few economists were studying this relationship instead preferring to look at more “measurable” scientific relationships. But today, some of the more interesting research looks at the effect of expectations on the economy. Even though the economic news may be frightening, we need to remember that great opportunities present themselves in the middle of recessions. The September 2008 issue of Inc. Magazine notes this in its article “Inc 500: Half-a-thousand reminders that business ingenuity and economic leadership still start with entrepreneurs.” Over 70% percent of its current list of Inc 500 companies started during the economic and terrorist crises of 2000-2003. So let’s all resist the urge to panic and look for opportunities in the midst of the turmoil to build faith organizations that serve individuals or communities rebuilding lives. The need is great. And if we are following God, we have nothing to fear. I've been asked today what are the rules governing FDIC deposits. With today's news on the failure of the bailout bill, it's a smart practice for businesses, nonprofits and individuals to take a look at their bank accounts. The FDIC has a handy calculator called "Edie" that you can enter all of your bank account information and it will tell you whether you are covered or not. A corporation or LLC with several accounts at the same bank is only insured to the $100,000 on all the accounts together. This information is by no means comprehensive. I am not an attorney or accountant. I just wanted to give some preliminary guidance. If your organization has close to $100,000 in combined deposits at a bank it's wise to consult your accountant and consider opening up another account at a different bank. I recently wrote about how handling difficult customers can provide the skills to improve an individual’s personal relationships. Ironically, the very moment I was drafting my post, key members of our staff at Bud’s Warehouse were being yelled at by an angry customer. (So much for my comments that we very rarely have to deal with angry customers.) The experience became a God-given teaching moment for the staff where theory meets practice. Indeed, one of the top benefits of a work-based job-training program is the on-the-job-experience from real life situations. We don’t just teach skills…we live them. The next morning we spent our 30 minute teaching time reviewing our talk from the previous week on how to handle an angry customer. We identified points where we blew it. We commiserated about how ridiculous and angry this particular person was. We celebrated that we resolved the customer’s problem and earned an additional large sale from the person. We talked about ways to avoid the problem in the future. And we prayed for help in handling conflicts in the future at home and at work. One issue that came up from our discussion is how difficult it is to be “disrespected” by someone else. Individuals rebuilding lives from homelessness, prison or addiction have experienced many broken and destructive relationships. These experiences have hard-wired an automatic response to disrespect that often doesn’t help resolve conflict situations. We reminded each other that out top customer service principle is to serve each person walking through the door at Bud’s as if they were Jesus Christ, even if they don’t deserve it. (Colossians 3:23-24) We serve others because God served us. We love others because God loved us. It’s just another day in the life of a faith venture, a business as ministry on behalf of disadvantaged communities. Check out the latest award winners from the Drucker Institute and the Social Entrepreneurship Initiative. These innovative solutions to challenging problems will get your creative juices going. An economic downturn tends to hit unskilled workers first. Individuals with felony convictions or others issues related to poverty are usually the first to go. In addition, the steady flow of offenders leaving the prison system will find it harder to secure employment. There will be a need for more faith ventures in the near future to serve felons and poor communities being hit by the slowdown. At the same time that needs are increasing, organizations will find it more difficult to find resources. As noted above, donations to non-profits are already down. Traditional thrift stores are seeing a decline in product donations. For-profits are discovering that investors are more cautious of investments. Non-profit faith ventures already find it hard to get bank loans. Now, for-profit businesses are seeing credit dry up from banks. It’s important to work to increase your cash position at once. Now is the time to strengthen your organization by cutting unnecessary costs and improving your overall efficiency. Focus on your mission and cut out extraneous activities. Seek creative low cost ways to tell your story. And work hard to cultivate new relationships and build stronger existing relationships. When times are good, it’s easy to expand your activities beyond your basic mission. An economic downturn can be an excellent time of refocusing on what your organization does. Focus your activities on your core mission and look for partnership with other organizations to fill in other services. I find that now is an excellent time to collaborate with local government agencies. Local workforce centers and TANF offices are developing creative programs that might provide program participants and resources for your organization. Even in the midst of economic difficulties, keep your eyes open for new opportunities. Challenges can be an excellent chance to think creatively and position your organization for the future. An innovative new approach or partnership will find an environment ripe with clients in need. Once again, we have to put the faith in faith venture. God passionately loves the poor. We need to have faith in God to provide the resources for a business as ministry that serves disadvantaged communities. Yesterday, I attended a luncheon celebrating the 20th Anniversary of Providence Network. Over my last 9 years at Belay Enterprises, Providence has been one of our top partners in urban ministry. Many of our job-training employees have been residents of one of Providence Network’s transitional homes. We have discovered over the years that individuals have a much higher chance of success at rebuilding a life when they receive 24 hour care between our two organizations: they work at one of our projects and they live at a Providence home program. The next benefit of our relationship is the gradual step-down of services between our two organizations. An individual usually either graduates our program or the Providence Network program first, allowing for a gradually integration into full self-sufficiency. Andy Cannon shared that one way to see that you are headed in the right direction is whether God brings a team of people around you with the same vision. In the messy world of urban ministry, not too many individuals make it as lone-rangers in ministry. If you are in ministry to the disadvantaged, you will face obstacles. And at those darkest hours of need, God will bring alongside key individuals to help. Bob Skold told about how Bo Mitchell once taught him that relationships were the key to any business. Whether you are selling a product or raising funds, it all comes down to the relationship forged between the two parties. And if the relationship is strong, it naturally allows a fundamental shift in the fundraising approach: You now aren’t asking for money but providing the potential donor with an opportunity to bless others. Bob Skold reminded that if a mission is from God the job becomes one of casting the vision. And the funding you need will follow. Providence Network was born 20 years ago out of a small group bible study led by Bob Beltz. A few men in that study became passionate about helping the disadvantaged in down-town Denver and raised the money for Providence’s first home. 20 years later, hundreds of lives have been directly impacted by the step of faith. This story mirrors the experience of Mile High Ministries starting from a bible study at Bear Valley Community Church, which then led to Belay Enterprises. Good things come when people gather to study the Word of God and then work to apply it to their own lives and the world around them. Congratulations to Andy Cannon, Derek Kuykendall and all the rest of the staff and volunteers at Providence Network on your 20 years. Yeah God! In phase one of our job training program at Bud’s Warehouse, employees are introduced to the soft skills of employment: How to show up on time, do your best, dress appropriately for work and be honest at all times are a few of these employee basics. These are skills that individuals rebuilding lives from prison, addiction or homelessness may need to tune-up for future success. One of the most important of these soft skills is the ability to resolve conflict in a healthy manner. Whether we like it or not, conflict can be a frequent part of the work world and individuals coming out of jail are not the only one’s that need help in this area. Conflict can be as simple as a disagreement over a workplace strategy or as complicated as a long-simmering dispute between an employee and his or her spouse that carries over into lost productivity in the workplace. The reality is that in a fallen world where individuals are prone to look out for their own interests, competing desires can result in conflict. All businesses can benefit from teaching their employees how to handle conflict in the workplace and at home. Invariably, during this job-training lesson, program participants will talk about difficulties they experience with conflict at home. Many of our employees have experienced significant struggles with loved ones or other individuals. Their openness to share then allows us to teach how to apply workplace type strategies to personal situations. Now we are invited along for the journey as individuals attempt to solve personal conflicts. This is where business as ministry becomes very practical and provides grace to relationships outside the workplace. A major part of a business plan is defining the market for your service or product and then determining how you will provide it to your customer. 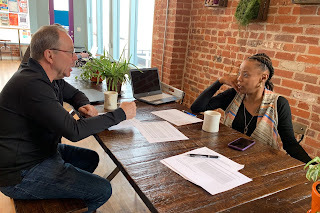 But if you are starting a business to serve disadvantaged communities there is one question you must resolve before all the others: will you structure your business as a for-profit or a non-profit? A few years ago, the structure question involved dealing with two very different entities. But in the last few years, the two organizational structures have begun to move towards what some writers have called a blending. Today, there are for-profits that are organized around social missions and there are non-profits that are running very large and profitable businesses. And for Christ-following entrepreneurs, whether they are running a faith venture or not, the distinction almost becomes non-existent. If all resources are God’s resources then the Christian business owner is just a steward of what is really God’s. They need to prayerfully seek God’s will for any profits that the business enjoys. In the end, the question is primarily an organizational one for faith ventures: what structure works best for what you are trying to accomplish? When you talk about entities organized around social missions, the traditional organization structure has primarily been to incorporate as a 501c3 non-profit. This is probably the cleanest structure for ensuring that the organization remains true to its mission. Unlike with a for-profit, there is very little chance that the entity will change owners and stop serving its social purpose. In addition, a non-profit business usually enjoys the benefit of not having to pay taxes on profits as long as the business is closely related to the mission. A non-profit business can offer donors tax deductions for donations of product or money. This can be a valuable source of start-up funds or of resources to cover the extra-costs associated with the entity’s social mission. Even with these advantages, there are some significant drawbacks to the non-profit model. It is difficult to obtain loans from banks because of the nature that no one person owns the business. This can be a significant problem to finding the capital to expand a thriving faith venture. In addition, it is difficult to structure ways for individuals to make traditional investments in the business. The lack of one owner can also sometimes make the faith venture less efficient than in a for-profit where someone actually owns the enterprise. These four reasons are why some faith ventures operate as for-profits. They seek the ability to scale the business through investment and believe that real ownership creates efficiency and business success. This happens whether a non-profit organization or an individual owns the for-profit business. The downside is that the business must pay taxes on profits and the business cannot offer tax deductions for donations. This fall, Belay Enterprises and Faithventure Forum will be hosting two Faith Venture Focus Events at 11:30 am on Thursday, October 16, 2008 and Thursday, November 6, 2008, at Bud's Warehouse in Denver, Colorado. Bud's is located on the north frontage road of I-70 between Dahlia and Colorado at 4455 E. 46th Ave in Denver. Followers of Christ with an interest in entrepreneurial ventures are invited to attend one of these information and brainstorming events. Together we will explore the intersection of faith and enterprise on behalf of disadvantaged communities during a two-hour lunchtime event. The focus session will seek input on what it takes to run an entrepreneurial enterprise. We want your advice on what you wish you had learned before starting. Belay hopes to build up a network of relationships and expertise that together can help incubate a network of entrepreneurial faith ventures creating opportunity for individuals rebuilding lives from addiction, prison, homelessness, or poverty. To learn more about this vision, visit this post about a faith venture vision and this post about felony entrepreneurship. The event is by invitation only and will be limited to 10 individuals for each event. We are looking for people with significant business experience, a heart for entrepreneurial ventures, and a desire to help the disadvantaged. If you are interested, please call Jim Reiner at 303-296-3990 or add a comment to this blog post detailing your interest and background as well as your contact information. This comment will be emailed to me and will not be posted to the blog unless you request. Contact us today! A basic principle of a business plan is defining your customer. In order to succeed, a business needs to have a clear understanding of the wants and desires of its customers as well as knowledge of what makes them unique. For most for-profit businesses, the answer is pretty clear-cut. The customer is the individual or business that has a specific need for your product. A contemporary rule of marketing is to make sure your product appeals either to a targeted niche of customer or to a large section of the broad market. So you have businesses marketing targeted services like Christianbooks.com or companies offering broad services like Amazon.com. For a faith venture, where business and ministry are linked, one must expand the definition of customer three-fold. Like a traditional for-profit, a faith venture needs to know who will purchase its product or service as the first level of customer. But unlike most businesses, a faith venture seeks to serve disadvantaged communities through its operation. So the second level of customer is often its employees or the community it seeks to help. The final level of customer is the most important...it puts the faith in faith venture. God must be seen as the principle customer of any faith venture in order for it to succeed at its mission. When a faith venture forgets God it forgets the very foundation of all it seeks to do. If you are planning a faith venture, let the three customers principle guide you. Build your business to serve God, your program community, and the individual or business that needs your product or service. Even if you aren’t building a faith venture, if you apply this rule to your private business, you will discover what God intends for a Christ-centered business: Serve Him, your employees and your clients. I recently posted about how difficult it was for felony offenders to find employment when released from jail. I saw developing entrepreneurial options for some felons might be the only possible route to employment in the future when insurance requirements make it impossible for businesses to hire them. A story in the September 2008 issue of Christianity Today, tells of a faith venture organization called Prison Entrepreneurship Program (PEP) that provides inmates in the Texas Department of Criminal Justice with entrepreneurial training from Ivy League MBA students. (Thanks to Business as Ministry Blog for pointing the way) This selective program only accepts participants who deeply desire change from past negative lifestyle choices. These inmates then receive extensive training in business and develop a comprehensive business plan. The program also provides teachings in Christian values and morality but does not require a faith commitment from participants. PEP was started in 2004 by Catherine Rohr, a 26-year-old Wall Street private-equity investor, and has graduated a total 420 students as of this past summer. This is a faith venture that understands the entrepreneurial spirit inherent in felony offenders. After my recent post on how home improvement thrift stores tend to be counter-cyclical with the economy, a Chronicle of Philanthropy blog directed readers to an article on new problems facing retail thrift stores. A story in The New York Times shared about how thrift store chains like the Salvation Army and Goodwill were experiencing an increase in sales similar to our experience at Bud’s Warehouse. But unlike our home improvement thrift store, they were also seeing a sizable drop in product donations. Some were worried about the possibility of running out of product later in the year. At the Salvation Army, sales were up by 5% to 15% with donations down by 10% to 25%. Goodwill was seeing increases of 6% in sales but a donation decline of 5%-10%. The organizations pointed to several factors contributing to these trends. Like at Bud’s, the slow economy has caused consumers to seek low-cost bargains at thrift stores. But at the same time, individuals with extra clothing have increasingly decided to sell the product on EBay or Craig’s List over donating to a charity. I suppose for large thrift store chains their scale of operations contributed to this problem. A large thrift store requires a large amount of clothing donations to sustain the enterprise. A percentage decrease in donations is multiplied in effect. In our Baby Bud’s thrift store, we have not seen a decline in baby clothes donations but our operation is so small. The fact that we have chosen a niche specialty—baby clothes—and tied it to a specific mission--job training single mothers-- also woks to our benefit. The more you can tie your mission to your social enterprise, the more effective your marketing efforts. The problem that The New York Times has identified is not the end of large thrift stores. It is just a new economic reality that demands a new strategy. A thrift store manager needs to take advantage of increasing customer demand to shift marketing dollars from advertising for customers to advertising for donors. Non-profits in business need to see economic changes not as threats but as opportunities for new strategies and new markets. American society finds it difficult to give felony offenders a second chance in the area of employment after they are released from jail. Business insurance requirements and owner liability concerns make it difficult for businesses to hire individuals with felonies. Yet, the post-incarceration success of offenders is directly related to their ability to secure employment. At Belay Enterprises, we’ve had success placing non-violent felony offenders into real jobs in the community after they’ve completed 6 months to one year in one of our employment training businesses. Private businesses are willing to hire offenders after they’ve proven themselves with an employment history and the successful completion of a program. But for offenders with a violent felony offense, future employment opportunities are almost completely nonexistent. This is the case even though, in our experience, there are significant degrees of variance in the seriousness of violent offenses. For instance, running into a police car while driving under the influence of drugs becomes a violent felony offense even though it is unlike a felony assault with a deadly weapon. So for a certain number of felons with violent and non-violent offenses securing employment becomes impossible even though it has many positive benefits for society. I believe that one possible answer to this dilemma is through entrepreneurial opportunity. Many of the felony offenders that I have met over the years are very entrepreneurial in nature. They have just created businesses, like drug operations, that were against the law. By channeling their business talents into healthy, law-abiding operations they can create enterprises that allow them to support their families while building resources for their communities. They just need support from other Christian entrepreneurs helping them think through a business plan and the other basics of start-up enterprises. With the right mentoring support, I believe that felony offenders can create successful operations in the areas of landscaping, recycling, HVAC, janitorial and home improvement among many others. In past years, Belay Enterprises has worked to help individuals in disadvantaged communities create their own enterprises. Recently, we have focused more on incubating our own employment training businesses. I am hoping over the next few months to build a network of Christ-following entrepreneurs that want to use their gifts and time to mentor individuals from disadvantaged communities in the creation of business enterprises. By investing in others, they will help build ventures with the power to impact society for the kingdom. This is true business as ministry. Stay tuned for more information on how you can get involved. Everyday in the news there are stories of non-profit organizations struggling with a decline in donations. The current housing crisis has impacted giving patterns to many charities forcing some to cut programs and lay-off staff. In the midst of this economic environment, thrift store faith ventures may provide one of the few refuges from a down-turn. Over the last ten years, Bud's Warehouse has experienced some of its best sales results during times of economic troubles. In the months following 9/11, Bud's had a period of sales growth. We are seeing that same pattern occur right now in the midst of the housing crisis. It seems that thrift stores provide a hedge against the economy because of their inherent countercyclical nature...especially thrift stores that specialize in home improvement. When individuals are feeling pinched economically, they are more likely to shop at a discount store. At Bud's, we've also seen a counter-intuitive rise in product donations. People are more likely to do home improvement work on their own home verses moving. They are quick to call us with donation of home improvement products they are replacing. Companies also seem to have more time to spend in their warehouses so more product is being donated. Together, it's the perfect environment for increased sales and one of the rare places for program growth. The flip side is that when the economy is strong, Bud's has had times of flat or even declining sales growth. So in the home improvement thrift store business what is down is up and what is up can be down. In a business start-up, an entrepreneur must be able to wear many different hats. There is the sales hat, the marketing hat, the bookkeeping hat and more. In a faith venture, where you are seeking to accomplish both good business and ministry on behalf of disadvantaged communities, the number of roles explodes and rarely diminishes over time as the enterprise grows. A faith venture has two bottom lines: profits and life change. These two aims are not always positively related and sometimes impose costs on each other. 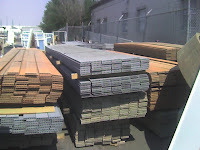 At Bud’s Warehouse, we attempt to support our operation through the sale of donated building materials at the same time employing individuals starting over again from prison or addiction. That creates a very interesting dynamic. When you hire someone who is rebuilding a life from addiction or prison, there are labor premium costs that hit your bottom line. Bud’s employees are dealing with significant problems and need extra support in order to succeed on the job. As a result, we are always operating on the edge of what a business can handle in terms of staffing because we choose to invest resources in people with added labor costs. The tradeoff becomes hiring a healthy (for lack of a better word) manager verses hiring additional individuals rebuilding lives. Today at Bud’s, life got in the way, as it tends to do from time to time. And the organization was stretched to its limits. One of our program staff members, who filled an essential manager role, had to unexpectedly leave work. This happened on a day when other backup managers were taking needed days off. To add to the perfect storm, we were slammed with customers attempting to purchase items for last minute summer projects. We were suddenly understaffed and “over-customered” during the month when we inventory everything in the warehouse. We plan for days like this by attempting to cross-train everyone for those fill-in times when others aren’t available. But sometimes the best-laid plans don’t always work. You just try to get through the day and hope customers understand. Both for-profit businesses and non-profit businesses deal with a scarcity of resources, but it seems that the not-for-profit world deals with more accentuated trade-offs. The temptation is to blame poor service on a lack of resources because “we are a nonprofit and we’re doing great things for the world.” The great challenge is to balance the double bottom line: staff so you can take care of both your business customer and your program staff member without having to make excuses. But then you work hard to create an environment of grace so that your customers understand and allow you to serve your employees emergency needs. It’s a tall order. Joseph Conrad popularized the idea of the no-win situation in his book Catch 22 in the 1960’s. Over the last 9 years at Belay Enterprises, I have joked that our faith venture businesses of Bud’s Warehouse, Baby Bud’s and Freedom Cleaning Services have been in the business of Catch 22’s. Indeed, the most obvious Catch-22 provides one of the top reasons for the creation of our employee training businesses. Felony offenders in community corrections programs are required to find a job or else they face a possible return to jail. Unfortunately, securing a job with a felony conviction is like finding your car in the Denver International Airport outdoor parking lot after a major blizzard. Many employers won’t even consider hiring someone with a prior felony conviction. Bud’s Warehouse exists as a transitional employer that will hire felons and then graduate them to jobs in the community. We have found that companies are more likely to hire a felon after being successfully employed in our program for a year. Another frustrating Catch-22 is the issue of child support and driver’s licenses. At Belay, we have had the pleasure of seeing both sides of the issue. In the Denver Metro area, many employers will not hire an individual without a driver’s license. It’s one of the very first questions we deal with in our program: what needs to be done to get your driver’s license? Often, the answer relates to getting caught up with past due child support. So in order to catch up on child support you need a job, but few will hire without a driver’s license. More than once, we’ve had employees arrested for driving to work or running family errands without a license compounding their problems. And we’ve been on the other side of the issue. At Baby Bud’s, almost every single mom in the program has significant amounts of child support owed to her family. It’s money that prevents her from successfully supporting her family and escaping poverty. The catch-22 multiplies to include a third dimension. To its credit, government is starting to recognize this problem. In certain cases, the state is allowing work-restricted driver’s licenses to help individuals catch up on owed child support. But this is an area where government, business and non-profits need to think creatively to help motivated individuals rebuild lives to society's benefit. He tells how God cared for him when his own life was broken down on the side of the road. And now he wants to share that love with others. I thought of my friend’s roadside activities as we explored the fruits of the Spirit in Galatians 5:16-26. This particular morning we were going around the table during our weekly “hood check” sharing the ups and down in each of our lives. Only this time we were telling about times during the last week when we were aware of living out the fruits of the Spirit…times when we acted out of love, joy, peace, patience, kindness, goodness, faithfulness, gentleness, and self-control. And then we shared times when we didn’t. For some, this might seem to be a hard practice, but for our group at Bud’s, everyone was quick to share stories. Most were about times when they acted loving…when they sacrificially served someone without expecting anything in return. And others were about how they had not acted loving and instead pursued selfish goals. We prayed to God celebrating the times when fruit showed up in our lives and prayed for forgiveness when it didn’t. And we listened for God. I remembered my friend and his roadside blessings. For individuals rebuilding lives from addiction, prison or poverty, two of the most important ingredients to future career success in the Denver metro area are qualifying for a driver’s license and purchasing a car for transportation. This reality provides the reason behind the creation of the Good Neighbor Garage in 2004. In communities like Denver where public transportation does not adequately serve outlying areas that provide high-quality entry-level job opportunities in construction, a car means the difference between a well-paying job or a lower-quality day labor position. Traveling by bus or light rail just doesn’t accommodate an industry where job locations frequently change and start-times are often very early. And for individuals with children, their attempts to juggle child-care, schooling, and traveling to a job site without a vehicle becomes nearly impossible. Marc Veldhuizen, in partnership with Belay Enterprises, started The Good Neighbor Garage as an innovative faith venture that receives donated cars from the public. These vehicles are screened for quality. Those that will provide dependable transportation for at least a year are repaired and placed for a small fee with qualifying individuals needing a car in order to get to work. Other cars that do not fit program needs are auctioned or sold to the public to support car placement program expenses. In its first year, the Good Neighbor Garage placed around 27 cars with disadvantaged individuals. In 2008, the program is on pace to place 75 cars. When it reaches maturity over the next few years, the Good Neighbor Garage hopes to expand its program services to employ several individuals that are rebuilding lives in an automotive and mechanic training program. As part of Belay Enterprises’ mission of incubating faith ventures into independent ventures, the Good Neighbor Garage was spun off into its own nonprofit organization two years ago. Never underestimate the power of relationships or new technologies. And when you can link them together...look out. Recently, a local manufacturer was introduced to Bud's Warehouse by a neighboring business. They were discontinuing a line of composite decking and did not know what to do with 100,000 linear feet of the former product line. A business across the street suggested donating the product to Bud's...a company that was in the business of recycling and had developed a relationship with Bud's over the last five years. With one single recommendation, our job-training program received one of its largest product donations of the year. It reminded me of the circumstances of the biggest donation in Bud's history. Over a million dollars worth of cabinet doors were rescued from a trip to the landfill by a similar suggestion from someone witnessing the load on its way to the dump. The dirty little secret of the building industry is the large amount of waste. It's safer to over order a product instead of trying to find a match when you discover that you don't have enough. Bud's provides an answer for construction leftovers. And over the years, relationships have been a big part of rescuing materials headed to the landfill and converting them into opportunity for individuals rebuilding lives. Today, new technologies add to the relationship mix. A few years ago, an expensive classified ad was the best way to find customers for a specific product like composite decking. Now, a simple ad on Craig's list attracts ten times the number of interested customers at the great price of free. Many of these new customers become clients for life because of the relationship built during the first transaction. So technology like Craig's list helps to build relationships that ultimately change lives. A smart faith entrepreneur sees new technologies as opportunities to change the world. If you were in charge of reducing the recidivism rate in your community, what factors would you point to as decreasing the odds of a former inmate returning to prison? Since drug addiction is a major contributing factor to felony convictions, some might urge that enrollment in drug and addiction programs would reduce the rates of return to prison. Others might suggest that adult education classes or family services programs would decrease recidivism. Some might recommend the provision of mental health services. In fact, a 1994 study of successful community corrections outcomes and 2 year recidivism rates for offenders leaving the Colorado penal system showed that all of these factors contributed to a decrease in return trips to prison. Individuals who successfully completed community corrections were older, educated, employed and participating in community programs. 75% of individuals who successfully completed community corrections remained crime free after two years. But one factor stood at the front of the pack. Employed offenders completed the program three times as often as those who were unemployed leading to the lower recidivism rate. In addition, employment after release from community corrections reduced recidivism rates further. Even so, few businesses will hire individuals with felony convictions. This data shows that faith ventures are an important ingredient to reducing return trips to prison. By creating a business that employs individuals rebuilding lives from felony convictions, the faith venture creates opportunity for individuals that few businesses want to employ. And faith ventures are uniquely qualified to reduce the recidivism rate even further because they not only provide a job but also include programmatic and spiritual resources to their employees. This is a call to action for followers of Christ interested in business and non-profit entrepreneurship. Faith ventures that offer employment and a full-spectrum of services make a positive difference in the lives of offenders and help them to achieve the life that God intends. Is God calling you to use your talents to build a better community in Christ’s name?